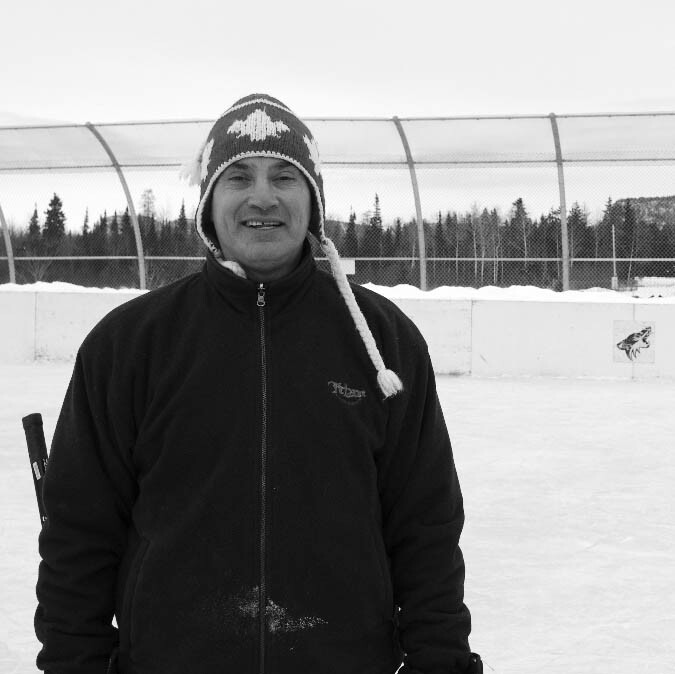 Youth held in custody at a Thunder Bay youth detention centre had the opportunity to learn hockey and life skills from a former First Nations NHL player from Feb. 4-6. John Chabot, who played in the NHL for nine years in the 1980s, instructed about a dozen First Nations youth at the Justice Ronald Lester Youth Centre. The hockey camp was part of the Hockey for Development program, which was created out of a partnership between Right to Play and the Ministry of Children and Youth Services (MCYS). By learning the game of hockey, Chabot said, youth in secure custody can develop important life skills, including fitness, nutrition, teamwork leadership and goal setting. “The level of hockey is good, the understanding and acceptance is good,” Chabot said as the youth practiced behind him. He said one youth only knew how to skate but never played hockey before the camp. Chabot is a member of Kitigan Zibi Anishinabeg First Nation in Quebec but grew up in urban areas. But while most of the youth in the camp are from isolated communities, he said they faced similar challenges as individuals. Hockey, and sports in general, is a way to allow the youth to share more common ground. Lauren Simeson, sport for development manager at Right To Play, said the program was successful after seeing the youth develop skills and participate in off-ice leadership skills activities. “They’ve developed strong leadership skills, and they’re coming out of their shell and setting goals for themselves,” she said. The program is the second time Right To Play and MCYS have partnered up to provide a sports camp for youth in the centre. Last September, they organized a week-long lacrosse camp, where professional lacrosse players were brought in to work with the youth. Zoltan Kovacs, a probation manager with MCYS and former Sault Ste. Marie Greyhounds coach, said the lacrosse program went “very well” and said they plan on holding it again but this time at a youth detention centre in Fort Frances in June. The Hockey for Development program is part of Right to Play’s Promoting Life Skills in Aboriginal Youth (PLAY) program, which is offered in communities across Ontario. Simeson said the PLAY program was held recently in Atttawapiskat, Webequie and Sachigo Lake. Following the Hockey for Development camp in Thunder Bay, Simeson said the PLAY program was heading to Big Trout Lake. “They’ve been so successful and there are a lot of inspirational stories that came out of it,” she said.